Azure, two swords Argent in pale hilted and pommeled Or, conjoined at the blade's midpoint and debruised of a crescent at a fess point, also Or. For a crest out of a ducal coronet a panache of peacock plumes, all proper, charged with the arms of the shield. This shield was bestowed upon a knight named Trzaska [”splinter”] by Prince Boleslaw the Brave [992 - 1025] on an occasion when an enemy rushed towards the Prince with drawn sword. The abovementioned knight blocked the way and shielded his lord, but could not withstand the enemy force for long. For when he struck at the enemy’s neck with all his might, his sword shattered almost at the hilt. The Prince, seeing this, quickly gave Trzaska his own sword. With it the knight, who was strong by nature, not only hacked that enemy to death, but slashed others as well, so that a circle thick with bodies surrounded him. Finally this sword broke off, too, and after the battle had been won he gave it back to Boleslaw. As a reward for his courage and beautiful heart, the Prince gave him the shield in this form. 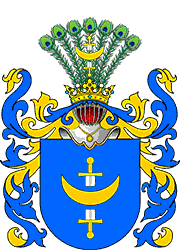 He was later called Lubiewa, because the knight endowed the Lubin monastery in Great Poland, where three members of this house, one after another, ruled as abbots, and in memory of this endowment by them, to this day that monastery uses the Trzaska shield in its seal.